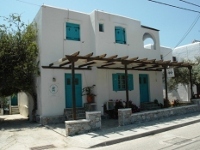 Styfilia apartments are located in Platy Yialos directly on the beach with a beautiful sea view. Restaurants, beach café bars, shops and bus stop are all nearby. Styfilia has only two apartments and one studio, making it an ideal choice for families or a group of friends. The Ground floor apartment is consisted of two separate bedrooms, an equipped kitchenette with washing machine, joined to a small sitting room with one convertible sofa bed, suitable to sleep only a child up to 12 years old, and a TV. The first bedroom has a built-in double bed with its own private bathroom with shower, mini fridge and TV, and an exit to a large shared ground floor terrace with a beautiful sea view, just above the beach. The second bedroom is open to the sitting room, separated from it with a decorative curtain. It has its own private bathroom with shower and separate entrance through the sitting room, with its own ground floor terrace facing the street and the mountains. The Studio is also located on the ground floor, sharing the large terrace with the ground floor apartment. Suitable for up to 3 persons, it consists of one bedroom, bathroom and a separate kitchenette. The studio has a sea view and is also equipped with TV. The Upper floor apartment with traditional furnishings is on the top floor and it is consisted of two separate bedrooms, a spacious living room with dining table and TV, joined to a fully equipped kitchenette, a bathroom with shower and a washing machine, a private balcony with panoramic sea view and Platy Yialos bay. An extra fold up roll away bed is added for a 5th person in the living room, while a 6th person can sleep on the built in sofa (only if the 6th person is a child), also in the living room. One bedroom has a double built–in bed facing the sea, with its own small private balcony, while the second bedroom has two single beds and its own bathroom. All units have air-conditioning (the apartments have one in each room), while free Wi-Fi Internet access is available throughout the premises.